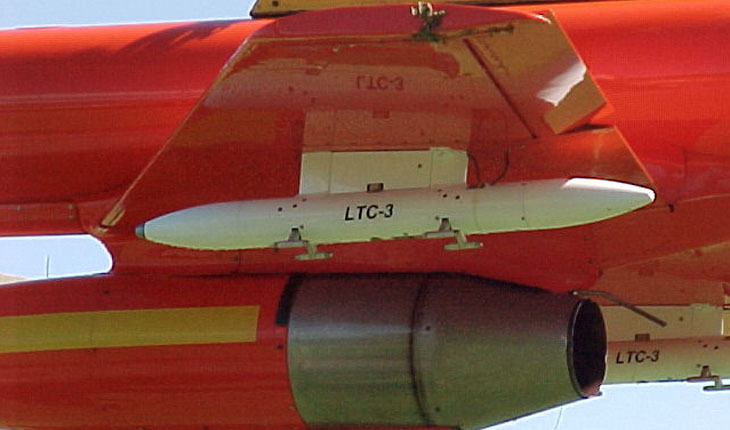 The LTC-3 launchers are intended for use in towing one-way targets from drone aircraft. The LTC-3 launcher has a deploy function (for initially deploying the target from the launcher), and a cut function to release the towline and target at the end of a mission. The launcher has a female receptacle to accept a standard target ball-lock pin. It is operated with a pyrotechnic deploy cartridge for the “deploy” function, and a pyrotechnic bellows actuator for the “cut” function. The launcher also contains an ignition unit that is used to ignite an IR target such as TIX-4. The user selects which type of target is used (IR vs. Radar) to enable or disable the ignition unit. The unit has adjustable sway braces to apply the correct pressure against the specific tow target body diameter. While currently a pure RF target, future developments include an IR version for air-to-air IR missiles such as AIM-9 and Magic.